Regular Tarot Bags - Witches in Moonlight Tarot Bag - Tarot Bags, Tarot Cards, Cloths, & More! Black bats and silhouettes of witches on broomsticks fly in all directions on this royal blue fabric. This tarot bag also features small white stars and yellow full moons. It's the perfect bag for anyone who is interest in witches or vampires. This bag is ideal for storing decks like the Halloween Tarot, Vampire Tarot, Fantastical Tarot, or Gothic Tarot of the Vampires. Witch Symbolism: Witches on broomsticks and bats are symbols of arcane knowledge. 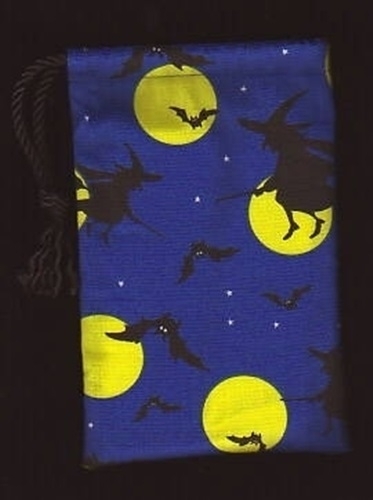 The witches and bats fly in front of a full moon - itself a symbol of women's mysteries and magic.